Seranita started life in San Diego, and near as I can tell, then traveled via Colorado, maybe Texas, Oklahoma and finally back to Northern California. 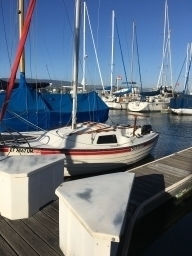 I recently put her into the water in at the Oakland Yacht Club on Alameda Island, in the SF Bay. One our dock mates is a Norsea 27.